St. Valentine's Day 2010 at St. Hilary's! The vicar is so thrilled here as he gives Miss Enid her special Valentine's Day present. As you can see he has wrapped it up in lovely red tissue paper.......after all the present IS special! Miss Enid is so thrilled with her new matching pair of gloves and purse as her old ones WERE looking a bit worse for wear! The vicar is telling her that the tradition of giving a pair of gloves to a special friend pre-dates Victorian times so he thought it would be a great idea to resurrect the tradition in St. Hilary's! 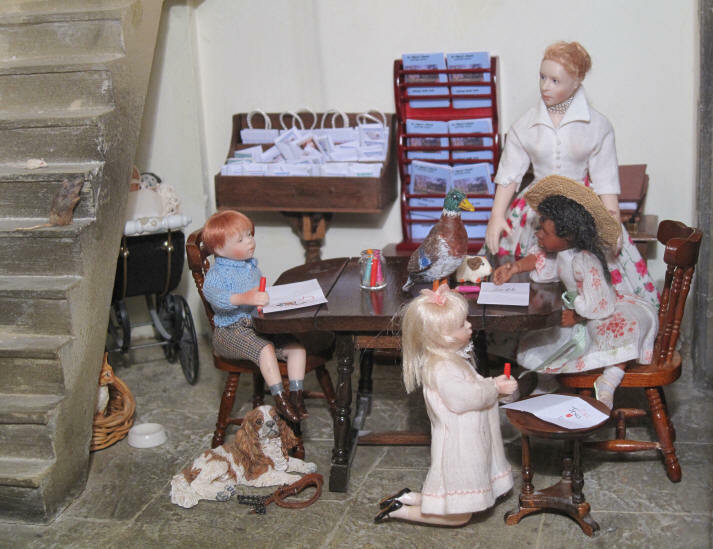 The children have asked Esther, their Sunday School teacher, if she would let them make Valentine's Day cards this morning. Of course Esther is very happy to let them! Robert Alexander says that he doesn't really like girls very much because he prefers to play with boys...........especially football! Ahhhhh.............can you guess WHO her card is for..................there is a clue here........................again find out in a mo because we must see what Priscilla Jane is doing with the card SHE is making. Meanwhile can you see that Eric has joined Grace as she is in the process of finishing her card. He is SO enjoying his visit to Daffodil Green isn't he? 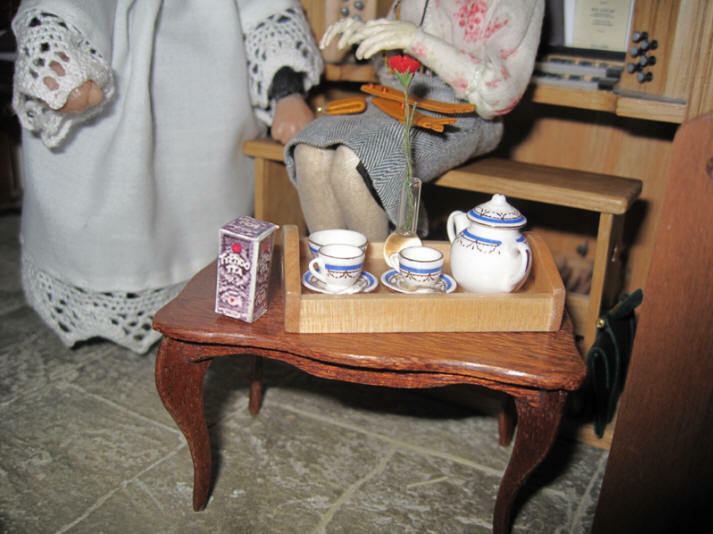 You can see a beautiful bone china tea service here....it is Miss Enid's very own and she has brought it to church today especially for this surprise........however Miss Enid only has the teapot lid.....where is the pot? HERE it is! Ambrose has offered to fill the tea pot up out of the urn on the trolley. Note that Grace has brought some "Gracie Cakes" to be shared in church because everyone loves them so much. Whilst Ambrose is making the tea Robert Alexander has given his "favourite girl", Georgie, his pet dog, her Valentine's Day card. She is thrilled with it of course but is a little sad as she is not able to draw a card for him too! Poor Georgie! Sepp the rat and Snowy the mouse enjoy watching all that is going on. Can you also see Magnifi-Cat sitting in his basket under the stairs? We can now see who Priscilla Jane has made a card for. It is her special school friend, Zac, who sits next to her in class. She SO wants him to join St. Hilary's Sunday School and come to church so she has made him a card to tell him how much Jesus loves him. SHE likes him "a lot", as she will admit to her friends in private, but she thinks that she will wait til she is a "grown up" before she has a "proper boyfriend"!! Grace too has finished her card.........and it is for none other than......GP! Of course poor GP.....he is trying SO hard to climb up her skirt to see it! Can you see what she has written..............."I luv GP lots and lots"! Miss Enid makes sure that she has hold of her new gloves and purse when the vicar comes over for his cup of tea out of Miss Enid's very own bone china tea service. As you can see.......this is a very beautiful tea service...........and she has even brought along her very own silver teaspoons too so that the vicar can stir his tea with one! She LOVES TyPhoo tea and has also brought her own packet to be sure Ambrose remembers to use it! Miss Enid has marked Valentine's Day with a special single rose that she bought and put in a vase especially for the vicar to see! Ambrose is such a kind boy. Grace is so proud of the card she has made for GP she is showing it off to Miss Enid. Grace is entranced by the beautiful tea servce and Miss Enid sees this. She is promising Grace that she will remember to take her and some of the other children who are interested on a special visit to "Aunt Sal's Teas" which is next door to the church for a special "high tea" one day soon. Grace is so looking forward to that.........and she also now wonders........would "Aunt Sal's Teas" want to have some of her "Gracie Cakes" to sell for one of her favourite charities or church funds? Many thanks to my sister, Catherine, for the rose which she made for me out of fimo. The tea service if from Stokesay Ware and the silver teaspoons from Mike Sparrow.